You can create custom products for any unidentified or misidentified software executable files. 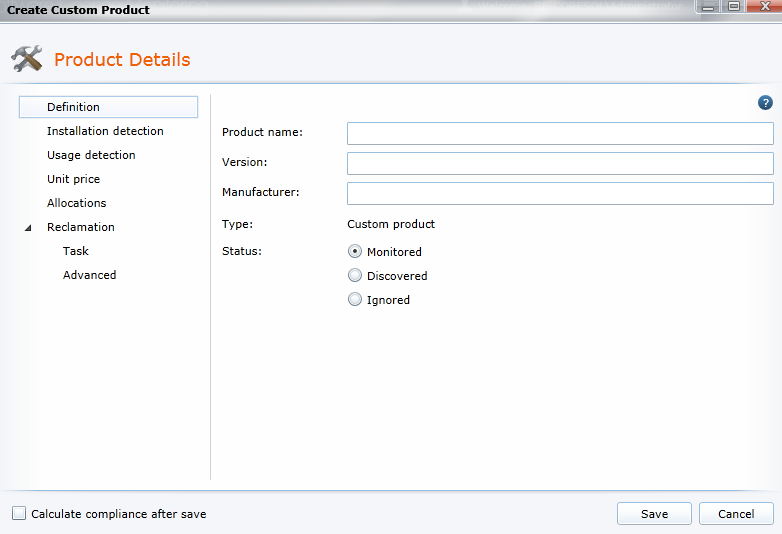 When you do this, the files in the custom product are added to the list of files that the inventory scanner looks for. You can specify which files indicate that the product has been installed, and which usage files indicate when the product is running on a computer. In some cases, you may want to use a Endpoint Manager query to find installed products. You would do this when a product is not identified correctly from executable files but can be identified based on inventory data that you add to a query. Click Products, and then click one of the product views (Monitored, Discovered, Ignored, or All). On the toolbar, click New > Custom product. Type the name in the Product name box. Type a number or number with a wildcard in the Version box. Type at least three characters in the Manufacturer box to show matching names. Select the manufacturer name. Click the Add (+) button. In the Add files dialog, you can select an existing filename (one that exists in the inventory database), or you can click Define new file and specify the name, size, and version number for the product file. Repeat this for every product file you want to use. When you have finished, click OK.
Click Usage detection. Use this option to include files that indicate the product is being used. Click the Add (+) button. In the Add file dialog, you can select an existing filename (one that exists in the inventory database), or you can click Define new file and specify the name, size, and version number for the product file. Repeat this for every product file you want to use. When you have finished, click OK.
You can also set up license allocations or a reclamation process for a custom product. For more information, see Allocating licenses and chargeback costs to a computer group and Reclaiming product licenses. IMPORTANT: The two types of detection files, installation and usage, are both necessary for gathering product data in inventory scans. Installation files indicate that a file has been installed; they're required to determine that a product exists on a computer. Usage files indicate that the product has been run; they're required to determine whether the installed product has been used. If a device's inventory shows a match for the installation files, software license monitoring (SLM) will report that the product is installed. However, if there are no usage files specified for the product, SLM will always report that the product has never been used. When creating a custom product, you need to define at least one usage file so that SLM will accurately report whether the product has ever been used.